No visit to Liverpool can be complete for Beatle fans without a visit to the most famous club in the world - The Cavern Club! And no visit to the Cavern Club can be complete without taking in one of the shows from the Cavern Club Beatles! Every Saturday night four Liverpool-born lads take to the stage in the Live Lounge of the Cavern Club, the same stage where Paul McCartney appeared in 1999, and, for the next two and a half hours take the audience with them on a journey -- a magical mystery tour -- through the Beatles' lives and musical careers from the early Cavern days through to Let It Be and beyond. The Cavern Club Beatles have an impressive pedigree. 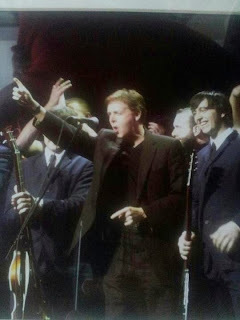 Jimmy Coburn (John Lennon) and Tony Coburn (Paul McCartney) are the only members of a Beatles tribute band to have appeared on stage with Paul McCartney when they all took part in the tribute concert to honour George Harrison in Liverpool in February 2002. Tony Coburn with the real Paul! Jimmy and Tony have just returned to the Cavern after a successful run on Broadway, starring as 'John' and 'Paul' in "Let It Be Broadway." Completing the line-up in the Cavern Club Beatles are Paul Jones (George) and Steve Finnigan (Ringo), who were awarded the roles after a nationwide search to create the Cavern Club's resident Beatles tribute band. Such impressive credentials promised a 'splendid time' ... and the Cavern Club Beatles did not disappoint! The show began with a series of video clips that set the scene and provided the historical context for the show. While this sometimes seemed to go on a bit too long (and I'm still not sure why so much time was spent on the year 1950), the way the film led into the live performance was fabulous. Bob Wooler's voice could be heard welcoming us all to the "best of cellars" and then the Cavern Club Beatles struck up the opening notes of "I Saw Her Standing There." From the first notes, it was clear we were in for an amazing night! The Cavern Club Beatles took us through the history of the Beatles from the earliest days in the Cavern, perfectly recreating the excitement of the live concert years, to the more sophisticated sounds of the mid-sixties. Tony Coburn as 'aul McCartney inciting a bit of Beatlemania! An enthusiastic and delighted audience sang, clapped and danced to classics including "She Loves You", "A Hard Day's Night" and "Day Tripper," and beautiful solo performances of "Yesterday" and "You've Got to Hide Your Love Away" provided the opportunity for the first costume change of the evening. Having taken the audience as far as 1966, the band took a short break which allowed the stage to be decorated with flowers and posters, celebrating the Our World broadcast of June 25 1967. Then the Cavern Club Beatles took to the stage again, but this time resplendent in Sgt Pepper outfits to delight the audience with pyschodelic classics including "Lucy in the Sky with Diamonds" and "I am the Walrus." The set finished with a fabulous singalong to "All You Need is Love"; the enthusiastic audience participation once more reflecting how much we were all enjoying the show. The final set began with video clips depicting the revolutions of 1968, and another change of costume for the Cavern Club Beatles who returned to the stage to evoke the Apple Rooftop concert, and the magic of the songs from the White Album and Abbey Road. The final song was, of course, "Hey Jude", with the audience all on their feet and singing along. 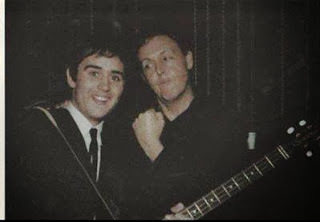 After such a fabulous show it wasn't surprising that the cries of "more" echoed round the Live Lounge, only to be drowned out by the cheers when the Cavern Club Beatles returned to the stage. I was expecting them to return, and perform Twist and Shout as an encore (it was noticeably absent from the first set), but to my delight, and the delight of everyone in the room, we were also treated to a selection of songs from the solo years. Both vocally and musically the show was perfect from beginning to end. I lost track of how many different guitars were used, but each was 'right' for the song being played. Both Jimmy and Tony Coburn recreated John and Paul's expertise on the keyboards, and Paul Jones' skill as a guitarist -- particularly when using the 12-string Rickenbacker -- was remarkable. Overall, the Cavern Club Beatles presented a perfect tribute to the Beatles. Obviously the quality of the music is the most important element, but the 'extras' were all there too. Characteristics of the Beatles were portrayed, but without resorting to caricature, and the ever-present Scouse wit of all the lads reflected the warmth, humour and charm of their role models. Here in Liverpool, the music of the Beatles can be heard from most bars and clubs, particularly round Mathew Street and the Cavern Quarter. But for a special show that pays tribute to the most famous band in the world in the most famous club in the world then a vist to the Cavern on Saturday night to see the Cavern Club Beatles is a must! The Cavern Club Beatles perform in the Live Lounge of the Cavern Club every Saturday. Shows regularly sell out so early booking is definitely recommended. For more information, or to book tickets, visit the Cavern Club's website by clicking HERE.